Most modern general style bikes come standard with two pairs of rack mounting holes on the frame. One pair is on the frame just above the rear axle - the legs of the rack screw in there. The other pair are on the frame about 80-120mm below the seat - you attach the arms of the rack to these points. Some bikes however lack a set or both sets of mounting points. It is still easy to fit a rack - see below. In rare situations, especially if you have a very long frame, the supplied "arms" of the pannier rack are not long enough. This is easy to fix as well: see below. Q. I do not have any mounting holes on my bike for the rack arms, what can I do? A. a) You can try attaching the rack arms to either side of the seat post clamp. b) Otherwise you will need to buy a pair of Pannier Rack P Clips. The diameter of the clip need s to match the frame diameter where you wish to fit the arms to. The bottom part of the P clip is coated in plastic to prevent scratching, the top part of the P clip has a hole in each side - through which you pass a bolt and to which you then attach the rack arms! As you tighten up the bolt the P Clip squeezes shut and will not slide on the bike frame - thus becoming the anchor point for the rack arms. Thus the clip which looks more like a U when you start ends up looking like a P!! Q. I do not have any rack mounting holes, what can I do? A. You can still fit a rack to a bike with no rack mount points - simply follow answer b) above for both the rack arms and legs - buy attaching the P Clips for the rack legs to each side of the frame, just above the axle. Q. The arms of the pannier rack are too short, what can I do? A. 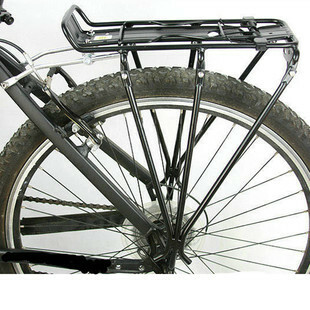 If your bike frame is very large, or the rear stays are longer than normal, then the standard arms supplied with most bicycle rear racks may not be long enough. To fix this you need to use a Pannier Rack Arm Extender. This simply bolts onto the existing arm to provide an extension.